As the week winds down, the weekend is just starting up. And let’s not forget what Saturday is (Valentine’s Day for all of those who need a reminder). Here’s a list of exciting events for everyone to enjoy. After years of touring in the U.S. and internationally, the Indigo Girls are teaming up with orchestras all over the country to bring their music to a different level. Experience the power of two, plus the Rhode Island Philharmonic, at the Providence Performing Arts Center this Friday at 8 p.m.
Classic rock band Foreigner will be at the Twin River Events Center tonight. With iconic love ballads such as “I Want to Know What Love Is” and “Waiting for a Girl Like You” this concert will strike a romantic chord with your significant other. The show starts at 8 p.m.
What better way to say I love you than with tickets to a basketball game? Well, if you like basketball that is! 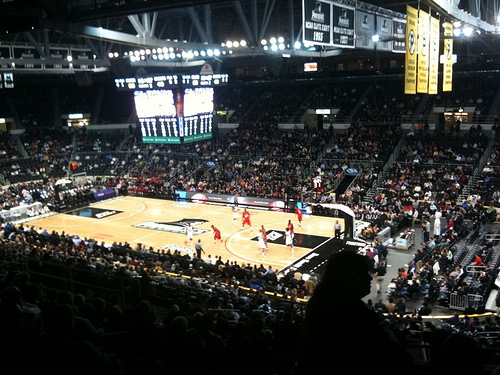 Watch the PC Friars men’s basketball team take on the Seton Hall Pirates at the Dunk this Saturday at 4 p.m. Cooking together with your significant other is a very romantic experience. Learn how to create some delectable surf & turf items with Professor Chef. Spots are limited for this 6:30 p.m. class, so book fast! Let’s not forget the kids this weekend. Bring the young ones over to the Providence Children’s Museum for a thrilling ride. Families will construct roller coasters and send marbles speeding down ramps and chutes. This thrilling activity is recommended for ages 5 and up and starts at 10 a.m. If you’re looking for a place to grab a bite to eat, or for a special getaway deal, be sure to check out our Romantic Escape page for tons of offers. Also, next week is February vacation! Visit our February Vacation page for some fun ideas for things to do with the family in and around Providence.